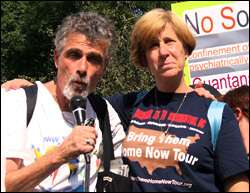 ... remind yourself that Cindy Sheehan managed to visit 21 states and over 50 cities and towns before being threatened with arrest. She had to come to NYC for that. Tom Moody has more. Allegedly it was over the use of amplification, but the city wouldn't give them permits after they were requested, and Union Square can be a noisy place. They should have added some religious content. People like the "Black Israelites" in Times Square are allowed to yell anti-white and anti-gay crap and Holocaust denials, using bullhorns, under the courts' view of the First Amendment. It's interesting that the denial of permits by the NYPD for things like a Cindy Sheehan visit don't seem to cause the same concern. Updated: Via a comment, Kim Arnold just provided a link to some of her video and images from the Union Square rally. Published on September 22, 2005 11:52 AM.